Concussions are a type of mild traumatic brain injury that children can receive as a result of falling off a bike while not wearing a helmet, bumping heads while playing sports or by other means of physical contact. 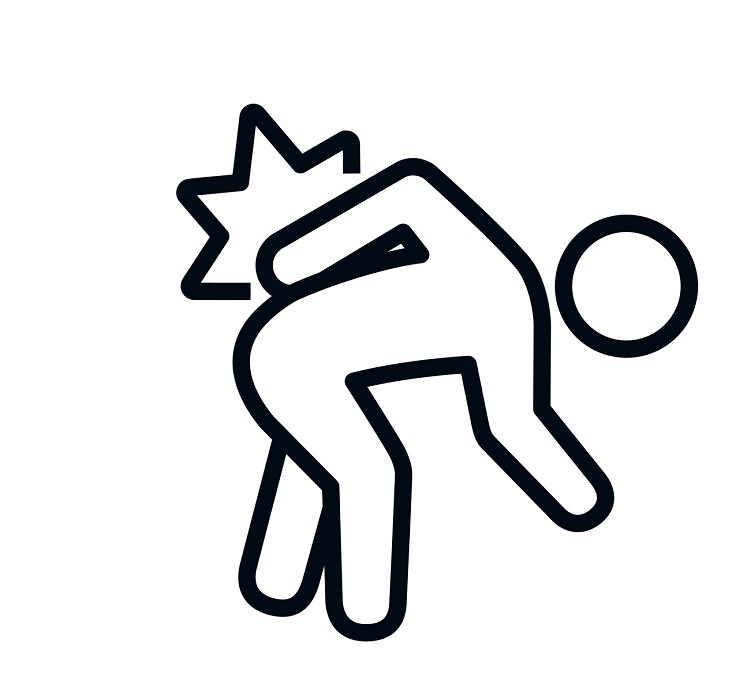 Concussions occur when a blow to the head or body causes the head to move back and forth with a lot of force. This sudden change of direction may cause the brain to collide with the inside of the skull, and result in a minor injury to the brain. These types of injuries to the brain can change the way nerves communicate and lead to concussion symptoms. Symptoms of a concussion vary in severity and can include headaches, dizziness, problems with memory or concentration, nausea or blurry vision. Some symptoms may begin immediately, while others may appear days after the injury. Symptoms can last anywhere from a few days to up to four weeks; therefore, parents should keep a watchful eye. If your child displays mild symptoms such as a headache or neck pain, you should consult a physician. Your doctor may request a full neurological exam. If the concussion is determined to be mild, cognitive and physical rest for the first 24 hours and a gradual return to routine activities are usually recommended. After 24 hours, your child may be able to complete simple tasks such as doing homework. However, if symptoms develop while performing these tasks, allow them to stop and rest then try again in a few hours. Sports should be avoided until symptoms have completely resolved and your child has been reevaluated by their doctor. Screen time should also be avoided because activities such as playing video games or watching TV can make symptoms worse. Mild concussions typically heal in a few days to a few weeks but if symptoms worsen or persist for more than four weeks, your child needs to be taken to the emergency room for further evaluation to rule out more serious causes for their symptoms. Please keep in mind that children should be taken to the ER immediately if they are displaying symptoms such as headaches that will not go away, seizures, loss of consciousness, persistent vomiting, excessive crying or slurred speech. These symptoms are severe and require urgent medical care. To avoid concussions, children should always wear seat belts in the car and helmets while riding bikes. Children who participate in sports should be encouraged to follow safe sports techniques. 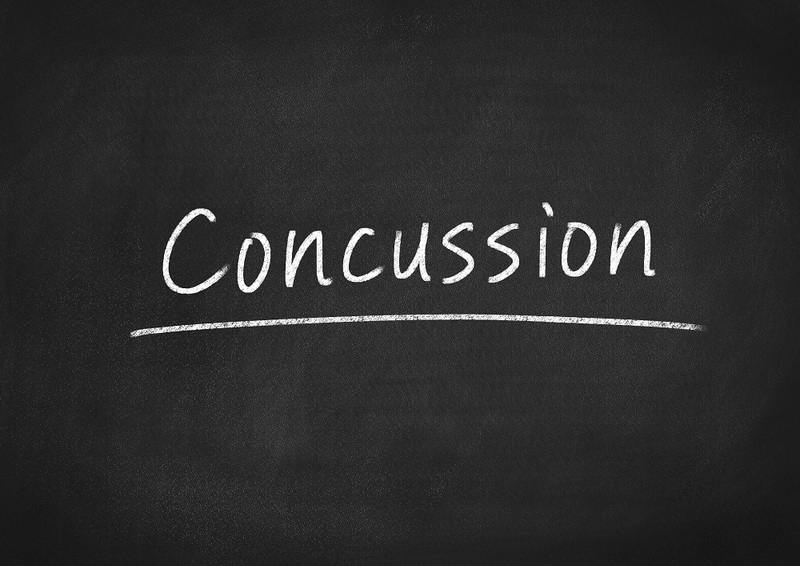 To speak with a Family Medicine doctor about concussions, please call (718) 206-6942. The keys to a healthy lifestyle are eating right, exercise, and what’s the third thing? Oh yes, sleep. While we give a great deal of attention to the first two, the importance of a good night’s sleep is often overlooked. March 10th through the 16th has been designated Sleep Awareness Week and Jamaica Hospital Medical Center and the National Sleep Foundation (NSF) want to raise awareness and educate the community about how important sleep is to each and every one of us. 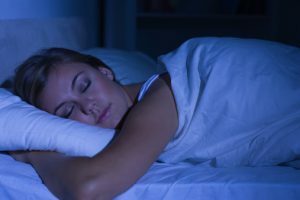 While most of us understand the importance of getting a good night’s sleep, we often do not make sleep a priority. The NSF recommends that adults receive seven to nine hours of sleep each night. They also provide the following tips to ensure a restful night’s sleep. Practice a relaxing bedtime ritual. Try to separate your sleep time from activities that can cause excitement, stress or anxiety; a lot of which can make it more difficult to fall asleep. Avoid drinking any caffeinated beverages at least five to six hours before bed. Exercise daily. Vigorous exercise is best, but even light exercise is better than no activity. Evaluate your sleep environment. Remove any noisy distractions, eliminate bright lights and set a comfortable temperature to optimize your sleep. Sleep on a comfortable mattress and Make sure your mattress is supportive. 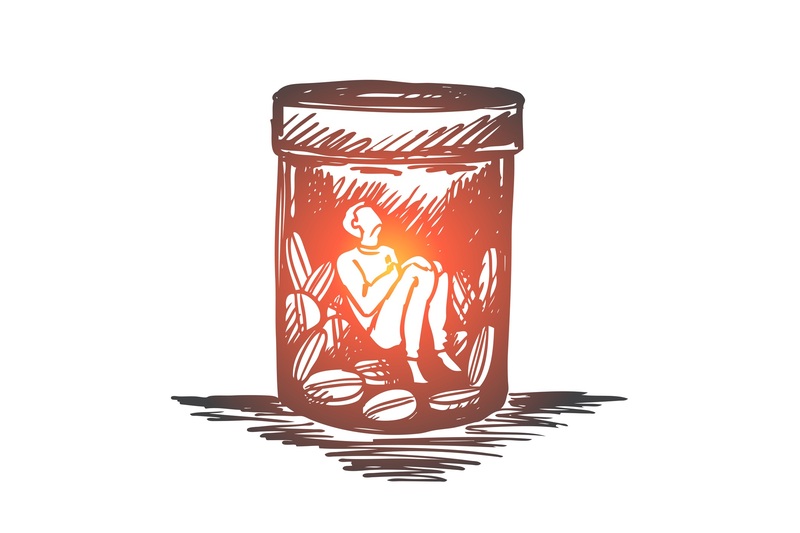 If you still have trouble falling asleep or getting a restful night’s sleep, you should speak with your doctor as there may be an underlining medical issue. Jamaica Hospital operates a state-of-the-art sleep center that can help diagnose and treat a variety of sleep disorders. For more information, or to make an appointment, please call 718-206-5916. Break Free from Osteoporosis by Learning How to Prevent and Manage the Disease. Osteoporosis is a disease that weakens the bones, making them more susceptible to breaking. Approximately 10 million Americans have osteoporosis and another 44 million have an increased risk, due to poor bone density. 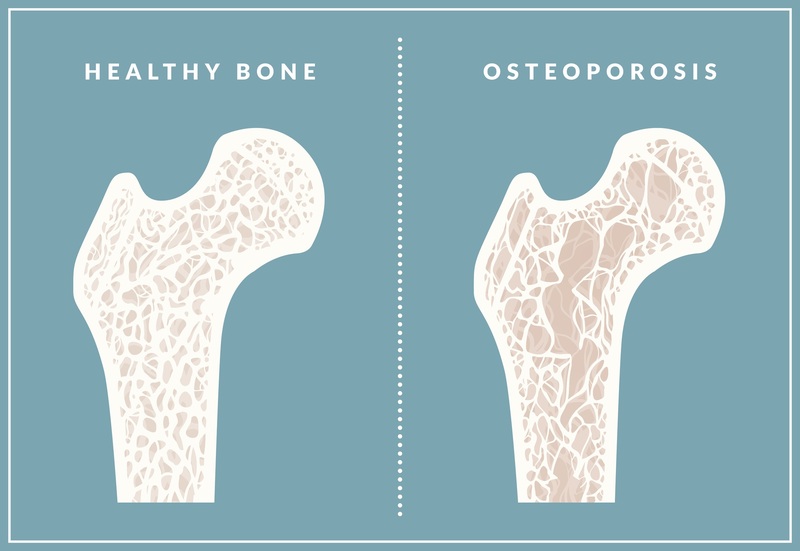 In fact, one in two women and one in four men will break a bone due to osteoporosis in their lifetime. • Gender – Women are much more likely to develop osteoporosis than men. • Age – The older you get, the greater your risk of osteoporosis. • Race – You’re at the greatest risk of osteoporosis if you’re white or of Asian descent. • Family history – Having a parent or sibling with osteoporosis puts you at greater risk. • Body frame size – Men and women who have small body frames tend to have a higher risk because they may have less bone mass to draw from as they age. • Hormone levels – Osteoporosis is more common in people who have too much or too little of certain hormones in their bodies. • Lifestyle – Excessive alcohol consumption and tobacco use can contribute to the weakening of bones. A bone density test can be performed to measure the proportion of mineral in your bones. During this painless test, you lie on a padded table as a scanner passes over your body. In most cases, only a few bones are checked — usually in the hip, wrist and spine. Hormone therapy or medications can be administered to treat osteoporosis, but there are side effects. Please consult your doctor. If you do not have a doctor, Jamaica Hospital has qualified physicians at our Ambulatory Care Center. To make an appointment, please call 718-206-7001. If you were to look in a textbook for a description of a pediatric dentist, you would read a definition that states “the branch of the dental healing arts that focuses on the condition of children and associated structures of the oral cavity.” However, if you ask a pediatric dentist to define what they do, you will get a much different answer. The truth is a pediatric dentist is so much more and there are many benefits to having a pediatric dentist treat your child. One of the biggest advantages of choosing a pediatric dentist is their gentle nature. Going to see the dentist can be overwhelming for many adults, so imagine how a young child must feel. Pediatric dentists are aware of these common concerns and because they have the training and skills to manage them, they are best suited to make your child feel comfortable and at ease once they are in the dentist’s chair. 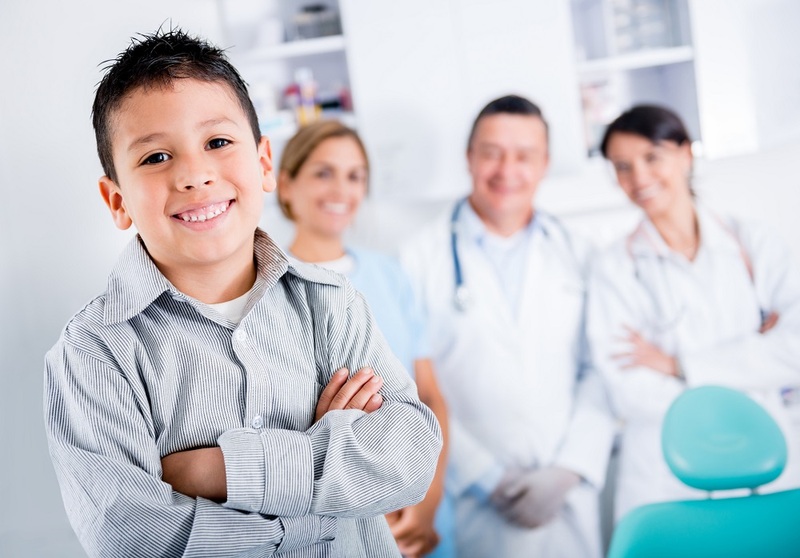 While having a dentist who makes your child feel comfortable is important, it is equally as important to make sure that the person taking care of them is well qualified; this happens to be another advantage of selecting a pediatric dentist. Pediatric dentists receive an additional two years of formal training to focus on the growth and development of a child’s oral cavity, from birth through the teenage years. Since pediatric dentists specialize in caring for children’s teeth, they are naturally better equipped to address the many potential problems that may occur, such as a delayed loss of baby teeth or the development of cavities and tooth decay. Pediatric dentists take a holistic approach to provide care to children and work with parents to identify environmental factors that may contribute to poor dental health, such as dietary choices and the potential risks associated with habits such as thumb sucking, teeth grinding or the use of a pacifier. These interactive opportunities serve to empower the entire family to lead a healthier lifestyle. Statistics indicate that pre-school children are getting more cavities than ever before, with one out of every four children having one by the age of four. In addition, children miss more time from school due to toothaches than they do from the flu. Due to these alarming facts, a pediatric dentist will practice developmentally-based dental care by focusing a great deal of time during your child’s initial visits on teaching them about good dental habits, such as how to properly take care of their gums and teeth. The pediatric dental team at Jamaica Hospital is dedicated to treating all children, from the time their first tooth erupts through their high school years. They believe the world is a happier place when it is filled with smiling children and they take pride in maintaining those smiles. For more information, or to schedule an appointment at Jamaica Hospital’s Pediatric Dental Center, please call 718-206-6980. For women, the decision to have tubal ligation, or getting their “tubes tied,” is a difficult one, but that decision no longer needs to be a permanent one. Doctors at Jamaica Hospital Medical Center now offer a tubal reversal procedure for women, giving them the opportunity to become pregnant again. While the overall success rate for conception is high for those who have tubal reversal surgery, there are some factors that affect this success, such as the degree of damage to the tubes during the original tubal ligation procedure, the weight and health status of the patient and other medical factors in the patient and the partner. The procedure traditionally takes from 2-4 hours and recovery time is minimal. 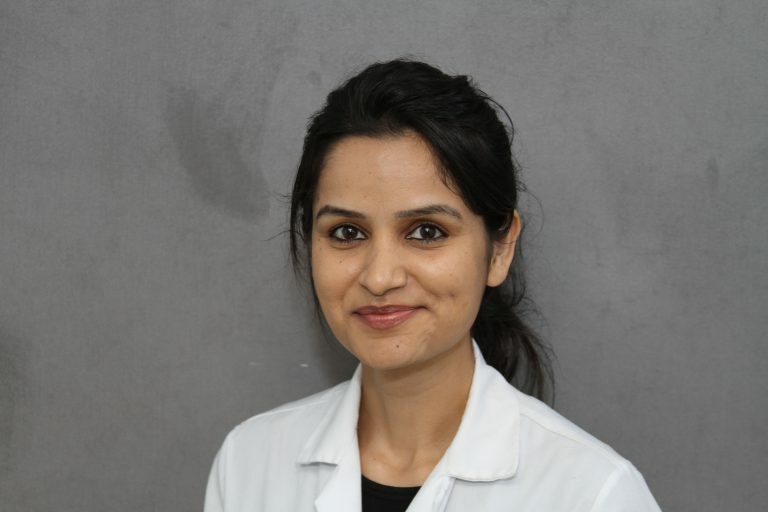 “In most cases, patients can try to become pregnant during their next ovulation cycle and every cycle after that, which is another benefit when compared to other options which only allow patients one chance of conception,” explains Dr. Zeitoun. To learn more about the tubal reversal procedure or to schedule an appointment with Dr. Zeitoun, please call 718-206-7642. • Complete stoppage of speech or the omission of a sound. 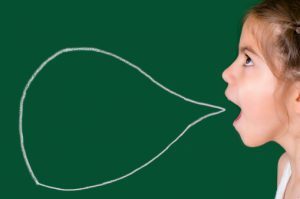 Stuttering can begin at any age, but it’s most common among children who are learning to form words into sentences. Boys are more likely than girls to stutter. Approximately one out of every 20 children will develop stuttering that lasts for more than six months, but this does not necessarily mean that stuttering is going to be a lifelong problem. Knowing what to look for and responding appropriately to your child’s stuttering will go a long way toward preventing it from becoming a more long-term or even permanent condition. • Family History – According to research, 60% of all stutterers have someone in the family who also stutters. • Child Development. – Children who have other language and speech problems are more likely to stutter than children who don’t. • Family Dynamics – Some children’s stuttering has been attributed to high family expectations and a fast-paced lifestyle. Talk to your doctor if you are concerned about your child’s stuttering. Your doctor may refer you to a specialist known as a speech-language pathologist (SLP) who can evaluate your child and determine whether or not there is a risk of a long-term problem. In most cases, treatment primarily focuses on training and working with the parents to develop techniques to help the child cope with and get beyond his or her stuttering. • Create opportunities for talking that are relaxed, fun, and enjoyable. • When conversing with your child, try to create an environment with limiting distractions, such as the presence of television. • Don’t be critical of your child’s speech or insist on precise or correct speech. Don’t correct his speech, or complete his sentences. • Don’t put pressure on your child to verbally interact with others when stuttering becomes a problem. • Listen attentively to what your child is saying, maintaining normal eye contact without displaying signs of impatience or frustration. • Model a slow, relaxed way of speaking to help your child slow down his own speech. • Don’t be afraid to talk with your child about stuttering and answer questions. Explain that disruptions in speech are common. 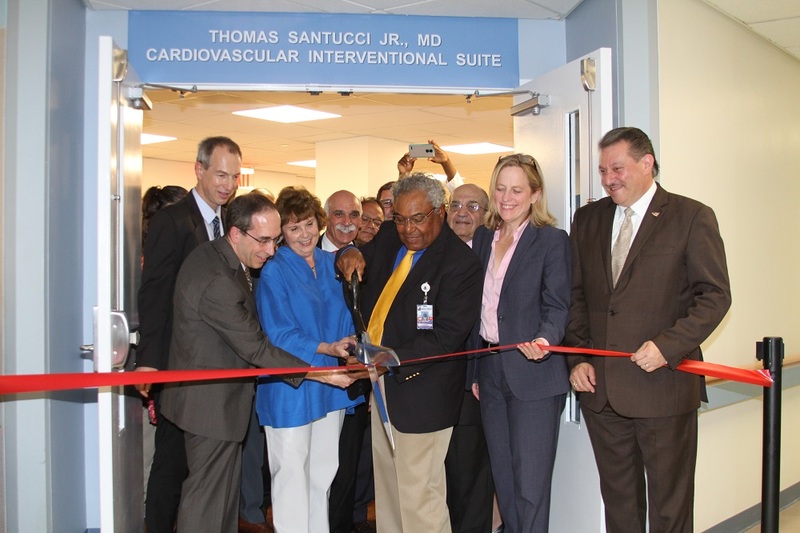 This summer, Jamaica Hospital Medical Center held a ribbon-cutting ceremony to commemorate the opening of the Thomas Santucci Jr., MD Cardiovascular Interventional Suite, named in honor of the late and beloved cardiologist and former Chairman of the Department of Medicine. Joining the hospital for the occasion were special guests of honor: the family of Dr. Thomas Santucci Jr., Queens Borough President Melinda Katz, Senator Joseph Addabbo and members of Jamaica Hospital’s Board of Trustees. Over 100 guests and the media were also in attendance. Jamaica Hospital President and CEO, Mr. Bruce J. Flanz welcomed everyone as they buzzed with excitement, to the new, state-of-the-art cardiovascular care facility. The suite covers 6500 square feet of space and includes two interventional labs, a six-bed recovery unit, a preparation area, as well as viewing, treatment and examination rooms. The facility is also equipped with the latest and most advanced technologies in cardiac and stroke care. Both labs feature Siemens Artis Zee Ceiling- Mounted Systems which provide high patient-positioning flexibility, affording doctors easier and full-body access to patients. Mr. Flanz explained to guests that all features and amenities of the Cardiovascular Interventional Suite were carefully selected by the Cardiology Department with the goal in mind of meeting the growing needs of patients. “There is a significant prevalence of diabetes mellitus, hypertension, hyperlipidemia and obesity in our area, all of which contribute to the growing incidence of all types of cardiovascular disease, including heart attacks and strokes,” shared Dr. Robert Mendelson, Director of Cardiology and Chairman of the Department of Medicine. It is anticipated that admissions for cardiac disease to Jamaica Hospital will increase by 12% in the next five years and stroke admission by 11% during that period. In addition to treating patients who live within the hospital’s service area, the Cardiovascular Interventional Suite will provide emergency cardiovascular care to the many travelers who fly through JFK Airport. Each year, approximately 2,500 people are transported to Jamaica Hospital from JFK and 10% of those emergency cases are the result of a cardiac issue or stroke. 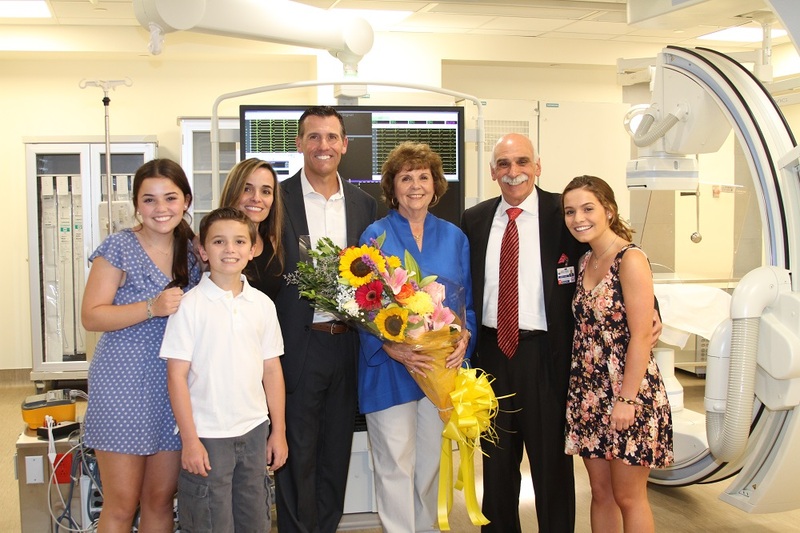 “Given the high volume of cardiovascular and stroke cases received by the hospital, the new Thomas Santucci Jr., MD Cardiovascular Interventional Suite will certainly be of great benefit to a significant number of people,” said Mr. Flanz. For many years, Jamaica Hospital Medical Center has offered our patients the opportunity to better manage their health care and interact with their providers, through the MyChart patient portal. Access to MyChart accounts has always required a patient’s physician to provide them with a special access code. Now, thanks to our partnership with Experian, our patients can create their very own MyChart account without needing an access code. For patients to create an account, they simply click the link to the MediSys MyChart website: https://mychart.medisys.org and click on the “sign up now” tab. We hope that this new method of creating an account will encourage more patients to sign-up. By offering our patients easier access to their records, we feel they will become better educated and empowered to take a more active role in their health and the health of their family, which we feel will lead to a healthier patient population.